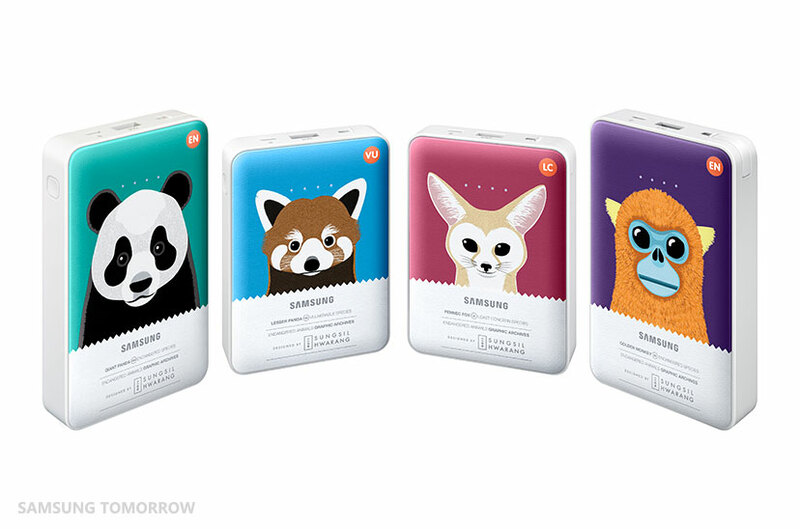 Samsung announced the release of its Animal Edition Battery Packs, featuring illustrations of four species of endangered animals as part of the company’s ‘Charge the Life’ campaign, which aims to raise awareness about endangered animals. 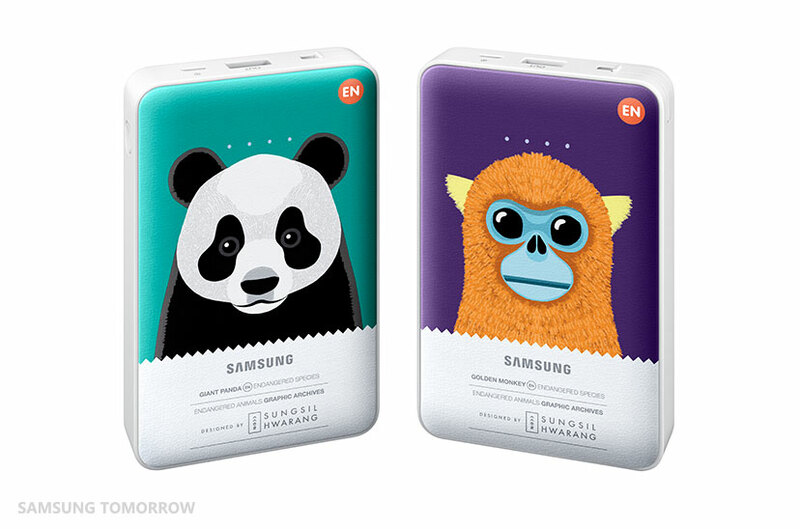 The Animal Edition Battery Packs will be available in two sizes. The 8,400mAh battery pack is equivalent to more than three times the capacity of the new Samsung Galaxy S6 battery, while the 11,300mAh battery pack is equivalent to more than four times the capacity. It can also charge a flat Galaxy Note 4 battery more than twice, making it the perfect companion when you’re on the go. 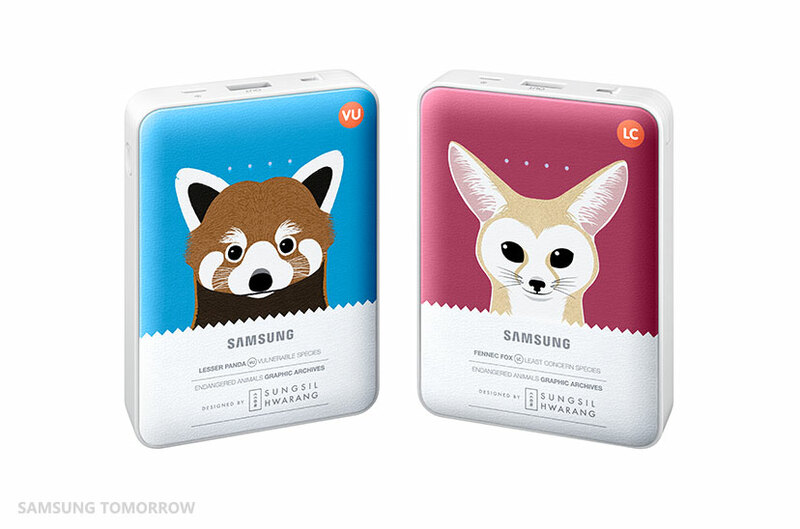 The lesser panda and the fennec fox will appear on the 8,400mAh battery pack, and the giant panda and golden monkey will be featured on the 11,300mAh battery pack. The Animal Edition Battery Packs will have a clear power level display and will be able to charge two devices at the same time. Additionally, the interactive ‘Charge the Life’ mobile application, which is available on Google Play and Samsung Galaxy Apps, will display the featured animal becoming more animated as charging levels increase. Lesser Panda Lesser pandas are about 42 inches long and weigh 10 pounds, featuring a long, bushy tail. There are fewer than 10,000 adults and listed as “Vulnerable” on the IUCN Red List of Threatened Species. Fennec Fox Fennec foxes are a small nocturnal fox found in the Sahara of North Africa. They are classified as “Least Concern” on the IUCN Red List of Threatened Species. Giant Panda Giant pandas are one of the most popular animals and a national treasure in China. There are fewer than 2,000 giant pandas alive in the wild and are listed as “Endangered” on the IUCN Red List of Threatened Species. Monkey Golden monkeys have a golden-orange patch on the upper flanks and back. They are listed as “Endangered” on the IUCN Red List due to the gradual destruction of their habitat. The IUCN Red List of Threatened Species is widely recognized as the most comprehensive, objective global approach for evaluating the conservation status of plant and animal species. From its small beginning, the IUCN Red List has grown in size and complexity and now plays an increasingly prominent role in guiding conservation activities of governments, NGOs and scientific institutions.